Governor Reynolds and Cornell Elementary student Guadalupe Sanchez did some “interactive reading” together at today’s event. Officials say reading test scores among Iowa students in the early elementary grades are rising. The reading proficiency of students in kindergarten through third grade went up nearly a percentage point during the last school year. By last spring, 70.5 percent of students in the early grades met or surpassed reading benchmarks according to Iowa Department of Education director Ryan Wise. In 2015, Iowa public and private schools started testing the reading skills of kindergarten through third grade students three times a year. Over the past three years, scores have gone up nearly seven percent. Wise said it’s important to have this “early warning system” so teachers know which students aren’t reading well. “Students who struggle to read early on are more likely to drop out of school, less likely to pursue post-secondary education and training, and less likely to earn a living wage,” Wise said. 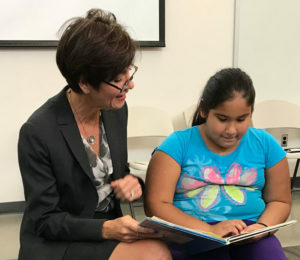 Governor Kim Reynolds credited teachers, administrators and teacher-training programs for have a role in boosting reading scores. “Working together, I think we’ve emphasized the importance of all children reading proficiently by the end of third grade,” Reynolds said. Reynolds held a news conference in an elementary school in the Saydel Community School District to announce the test results.